Last night I had the privilege of attending THE COCKTAIL HOUR: Fashion On The Rocks 1925 through 1965, a wonderful evening of food, fund raising (www.ocms.ca) and historical fashion show with commentary by Ivan Sayers. The wealth of his knowledge is legendary and he is full amusing tidbits about the garments and the era they are from. I only wish I had remembered my tape recorder as there were so many intriguing details, I would love to be able to listen to it again. The one thing I enjoy about Sayer's lectures is the way he is able to place the style of the garments in their political, social and economic setting. He also know the personal history of many of the garments - where they were made, who owned them, etc. It was fascinating to view the garments in historical order so one could follow the slow change in styles - how each lead to the next. The evening's show started with the 1920's. Post war women had proved themselves during the war and wanted to be taken seriously. Cocktail dresses from that era were soft and flowing, but the hung loosely from the shoulders straight down so as not to emphasis the figure. There were suggestions of the body underneath, but nothing obvious. As we slowly progressed through the different decades, the cocktail dresses first began to have slight hints at a waistline and then moved to more and more form fitting garments. Width through the shoulders and details like fringe on the hips added to the illusion of a small waist, giving women hour glass figures. One garment shown towards the end had a built in corset with a large full skirt and attached crinolines (something Sayers found in the U.S. and brought back through customs by cramming it into a duffel bag). The final dress shown from the 60's in some ways took us back to the start. Although a baby doll style (think Twiggy), it hung loosely again from the shoulders, hiding the body underneath. The technical detailing on most of these garments was unbelievable and Sayers had the hats (everything from closely cropped to wide brimmed to tiny tokens with veils), shoes, handbags, jewellery and long evening matching evening gloves that would have accompanied these dresses down perfect. In addition to following the silhouettes through the decades, he brought in the economic pressures of the time. If fabric was limited in supply, the dresses presented were not made with volumes of fabric. If designers needed to force women to purchase in a slow time, they dropped the hemlines so they couldn't just use an old dress by shortening it. Designers also tried to define a specific style of dress for each occasion a society woman might attend, forcing them to have large wardrobes. Other influences were seen such as "Egyptomania" which popular in the early decades. 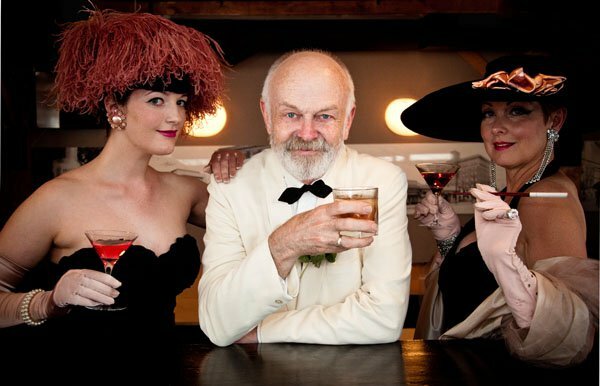 The Original Costume Museum Society and Ivan Sayers have new shows going on all the time, but you may have to email for upcoming dates as some are fund raisers or booked for specific groups. Topics might include - "What was I thinking" - fashions that just didn't work, haute couture and more. They are also working hard at fund raising for a permanent location to not only house their extensive collection, but to make it more accessible to the public. Here they would be able to have a rotating display of garments including an amazing couture collection that is currently in storage. As well, there would be facilities for students and professionals to research clothing from a specific era. To find out more about OCMS please visit their website at www.ocms.ca. If you are interested in learning more about Ivan Sayers, I interviewed him for Vancouver Fashion eZine. The article can be found in the current print collectible or can be read online at http://vancouverfashionezine.com/magazineissue30/fashionhistory.html.